Assuming you have travelled by plane to Malaga and hired a car there are two route options depending on whether you're in a hurry to get to the flying or prefer a scenic route that goes through the mountains and past the lovely town of Ronda. For most people we would recommend the first option following the instructions immediately below. The map below shows the quickest way to get to us on the new A357 which takes you via Campillos. 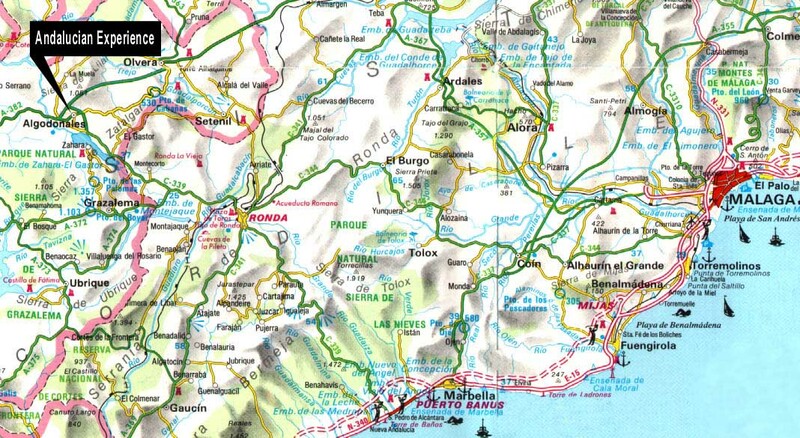 After leaving the airport you will need to join the N340 briefly in the direction of Granada and Motril but you need very shortly to look for a sign pointing in the direction of Cartama that will slip you onto the A357. From then it's easy driving on a good road, passing Cartama and carrying on to meet the A384 at Campillos where you head West taking signs for Jerez de la Frontera. It's now about another 35 miles to Algodonales. You can tell when you're about to arrive there because you will drive through a tunnel going uphill (just past the Southern landing field!) and immediately you exit this be on the look out for the slip road into Algodonales. Head straight into the Town Square and we'll see you shortly. The total journey is around 80 miles or 130 kilometres. For the scenic (but slow!) route follow signs for Cadiz E15/N340 passing Marbella until you get to San Pedro de Alcantara. Bear right heading for Ronda on the A376. Go past Ronda on the same road following signs for Sevilla for about 20 miles or 30 kilometres until you come to a T-junction. Turn left still heading for Sevilla and the Algodonales slip road is first right. Head straight into the Town Square.